Law enforcement say they drove to 6ix's home to confirm if the chain was truly stolen like he claims. They called someone inside his house presumed to be his baby mother and asked her to come down with his jewelry, which she did. 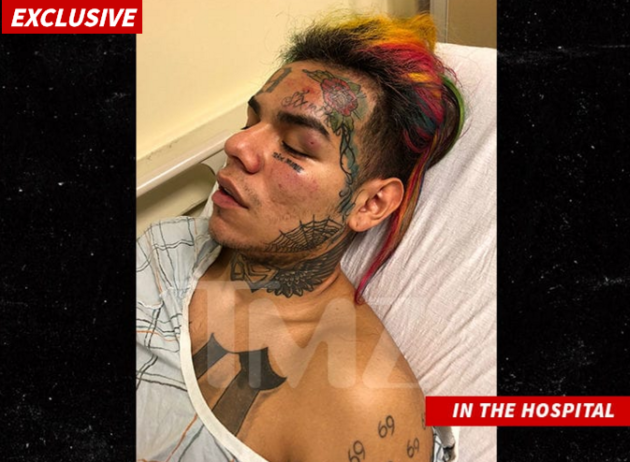 6ix was reportedly uncooperative with the cops, who say they have no idea how he got the bruises on his body. Tekashi 6ix9ine was kidnapped, pistol whipped and robbed and is now in the hospital, TMZ reports. Sources close to Tekashi tell the tabloid site that the rapper was kidnapped by three hooded gunmen close to his driveway after returning home at around 4 a.m from a video shoot in Brooklyn. The rapper was reportedly pistol whipped and knocked unconscious by the gunmen, who later broke into his residence to strip him of 750k worth of jewelry and between 15k to 20k in cash. 6ix9ine's baby mother and daughter were inside the house while he was being robbed, but were not hurt. TMZ reports the gunmen drove away from the scene of the crime with Tekashi in the back seat of their vehicle, but he managed to escape by jumping out the back door. After a brief chase, Tekashi reportedly jumped in the passenger seat of an oncoming vehicle and pleaded with the driver for help. The driver called for an ambulance that took the "FEFE" rapper to a hospital where he is undergoing a series of test.